After Paul started the church in Thessalonica, he wrote this first letter to the believers there within just a few months of leaving. In Acts, Luke recorded that Paul preached for three Sabbath days to the Jews in the local synagogue (Acts 17:2). However, most scholars believe Paul spent about three months, rather than three weeks, with the Thessalonians because he would have had to have been there long enough to receive more than one offering from the Philippian church (Philippians 4:15-16). Paul wrote his first letter to the Thessalonian church from the city of Corinth around AD 51, just a few months after having preached in Thessalonica on his second missionary journey. Upon leaving Thessalonica under duress, Paul, Silas, and Timothy travelled to Athens by way of Berea. But after a short time in Athens, Paul felt the need to receive a report from the newborn church in Thessalonica, so he sent Timothy back to serve and minister to the new believers there. Paul wanted to check on the state of the Thessalonians' faith, for fear that false teachers might have infiltrated their number. However, Timothy soon returned with a good report, prompting Paul to pen 1 Thessalonians as a letter of encouragement to the new believers. Everyone would like to have some insight into what his or her future holds. How much more so when it comes to the end of the whole world? First Thessalonians provides Christians with the clearest biblical passage on the coming rapture of believers, an event that will inaugurate the seven-year tribulation. At the rapture, Christ will return for His people. The dead in Christ shall rise first, while those still living will follow close behind. All believers will meet Jesus in the air to begin an eternity spent with the Lord (1 Thessalonians 4:16-18). Paul's specific, practical instruction for this process of sanctification can be applied directly to our current circumstances. By clinging to our hope in Christ, we may see several clear results in our lives: avoiding sexual immorality, refusing to defraud others, appreciating those Christians who serve on your behalf, refusing to repay evil for evil, rejoicing always, praying without ceasing, and giving thanks in all things—to name a few (1 Thessalonians 4:3-7; 5:12-23). This list, of course, is not exhaustive, but the first letter to the Thessalonians makes clear that every Christian should expect to grow in holiness over the course of his or her life. 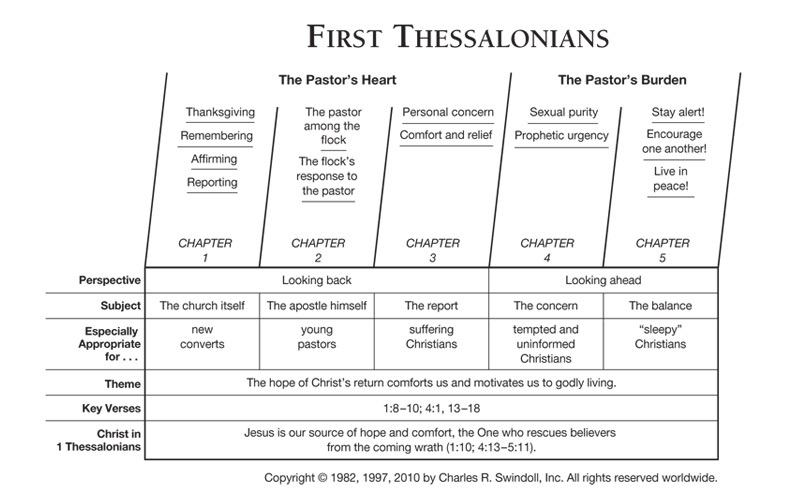 Find resources in the book of First Thessalonians in our resource library.